Our colors bleed red for a reason. 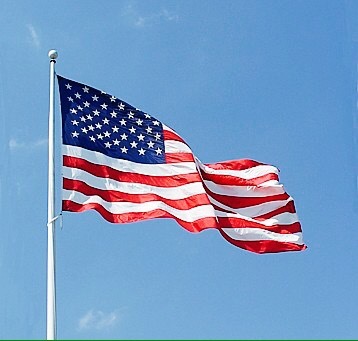 Therefore this flag we wave and pledge allegiance to with our hand over our heart is not to be taken lightly or in jest. America’s best have given their ultimate sacrifice; their very lives for this sacred honor to preserve our freedoms in the face of tyranny and to secure our rightful place in Universal destiny. Without the price paid; precious blood poured out on foreign soil, crucified by haters of liberty. Hence our freedom to choose life over death, freewill over oppression, and tolerance over hate should always be held to a higher standard as America’s flag which we raise up high. We are not the world’s doormat so please don’t trample, burn, curse, nor piss on the sacred ground or lay our flag down in surrender or disgrace. Too much blood of many young leaders (the best of all humanity) was spilled in the fight for our rights to live free and on which we proudly salute the red, white, and blue under the blood red sky as our eagle soars into the next incoming storm…America stands at attention greater than ever and ready to protect our freedoms and pursuit of life, liberty, and faith in our greater global community once again. Thank you with the highest honor to all who have served and continue to serve our great country; both here and abroad. In memorandum to my father, Melvin Adam whom served honorably in the Korean War.